On her first holiday in six years, Rumi is expecting to relax and unwind. But when she is set up by her long-time friend, she doesn’t shy away from the possibilities. Ahad, a charming, independent, self-made man, captures her imagination, drawing her away from her disapproving sister, Juveria. Faced with sizzling chemistry and a meeting of the minds, Ahad and Rumi find themselves deep in a relationship that moves forward with growing intensity. But as her desire for the self-assured Ahad grows, Rumi struggles with a decision that will impact the rest of her life. Confronted by her scandalized sister, a forbidding uncle and a society that frowns on pre-marital intimacy, Rumi has to decide whether to shed her middle-class sensibilities, turning her back on her family, or return to her secluded existence as an unmarried woman in Pakistan. We follow Rumi from rainy London to a sweltering Karachi, as she tries to take control of her own destiny. I wanted to read this book for two reasons firstly because of its cover and secondly because of ‘Dhoop Kinare’ (a Pakistani serial, I saw and loved when I was a teenager. I don’t know how many people would be able to relate to this, but still.) The cover and blurb reminded me of that sweet, soul immersing romance. These days most of the romance novels/ novella are focused on new adult romance, fast and bubbling. After a long time I have come across a story which has characters who are settled, mature. They gave me the feel of complexity involved in a relationship because of different upbringing and perspectives. Be it the sensible yet sensuous approach of Ahad in handling a fragile relationship with a woman he is attracted to, or sorting out her emotions and priorities by Rumi. I loved Ahad’s patience as he waited for her to come to him, it was so chivalrous and quixotic. It really sizzled! And I loved the way Rumi handled the rejection and later the acceptance. Natasha Ahmed has expertly brought out the conduct of both Ahad and Rumi enhancing the depth of the characters. And of course ‘Duniya gol hai’. Coming to Mahira, Ali and Faizan, friends everyone need and should have, wonderful characters. Juveria, is a natural one we see around us all the time. A person chained to legacy thought process, but she absolves herself later. I also liked the fact that the story was not unnecessarily stretched. Breaking conventional conservative barriers, for a woman, is not easy in our societies (both Indian and Pakistani), but the clarity in presentation of thoughts made the book fantastic read. Initially shifting POV’s bothered me, but once I got used to the style, it ceased to matter. I wished their reconciliatory conversation in the restaurant at Karachi could have been elaborated more, just for the reader’s pleasure. Overall, very entertaining insightful romance story which leaves you to ponder on; quote ‘feelings rather than commitment’and ‘love and marriage are not synonymous’, unquote. igion (since her book advocates sexual freedom for women) from her close but extremely large family. 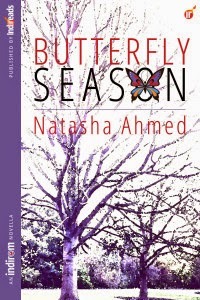 Butterfly Season is her first novella, though not, she hopes, her last. You can find more about Natasha on her website, Facebook page, or by following her on Twitter.